On the cover: Illustration by Sophia Pappas. For more of Pappas's work, go to sophiamariepappas.com. We want to begin by thanking editor in chief Anne Elizabeth Moore for deftly navigating us through these first few months of being an independent entity again. We couldn't have gotten here without her, and we wish her well. Managing editors Sujay Kumar and Karen Hawkins are co-piloting for now, and we all look forward to continuing to prove that independent local journalism can and will survive. Thank you to everyone for showing so much love for last week's first-ever Plants Issue. It was a gamble, and now we know: Chicagoans are, indeed, really into plants. 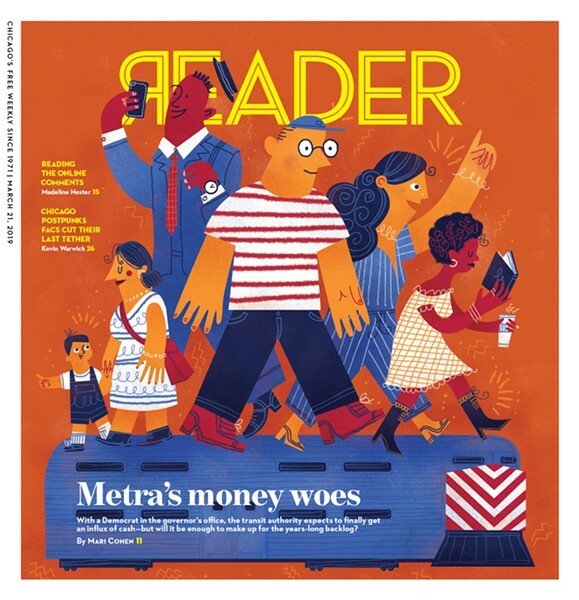 This week we explore how Metra is distant from the movement of progressive transit-oriented millennials, profile the Chicago band Facs, and review the newest film and theater in town.